AMC has released a brand new promo for the upcoming ninth season of their post-apocalyptic horror series The Walking Dead. The promo titled “Kaleidoscope” highlights the four remaining original survivors of the series while also featuring some of the show’s characters in their post-time jump looks. Check out the video below (via Comic Book). Last season brought the culmination of “All Out War,” which pitted Rick Grimes and his group of survivors against the Saviors and their cunning leader, Negan. With Negan’s life in his hands, Rick had a character-defining choice in front of him. By making the unilateral decision to spare Negan, Rick upheld the values of his late son, Carl, championed in order to build for the future, but created conflict within his group. Now, we see our survivors a year and a half after the end of the war, rebuilding civilization under Rick’s steadfast leadership. It is a time of relative peace among the communities as they work together, looking to the past to forge the future, but the world they knew is rapidly changing as man-made structures continue to degrade, and nature takes over, changing the landscape and creating new challenges for our survivors. As time passes, the communities confront unexpected obstacles, danger, and of course, walkers, but nothing quite prepares them for the formidable force they are about to encounter, which threatens the very idea of civilization that our survivors have worked so hard to build. RELATED: The Walking Dead Season 9 Premiere Photos Revealed! The series stars Andrew Lincoln (Love Actually), Norman Reedus (Blade II), Lauren Cohan (Supernatural, The Vampire Diaries), Danai Gurira (Black Panther, Avengers: Infinity War), Melissa McBride, Lennie James, Alanna Masterson, Josh McDermitt, Christian Serratos, Seth Gilliam, Ross Marquand, Austin Amelio, Tom Payne, Xander Berkeley, Khary Payton, and Jeffrey Dean Morgan. Newcomers to the series include Ryan Hurst as Beta, Samantha Morton’s Alpha from the comics, Lauren Ridloff as comic book character Connie, with Eleanor Matsuura as Yumiko from the comic series, and Fantastic Beasts star Dan Fogler in an undisclosed role. Based on the comic book series written by Robert Kirkman and published by Image Comics, The Walking Dead reigns the number one drama on television among adults 18-49 for the last six seasons. 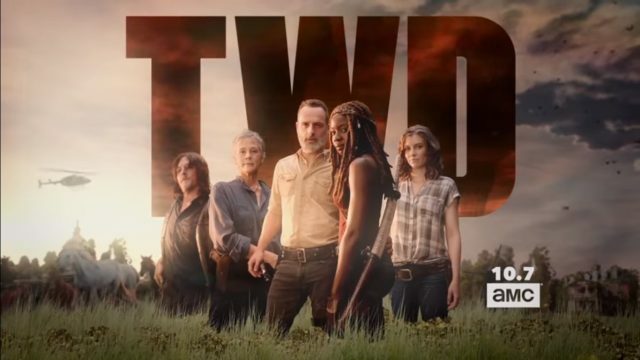 The series is executive produced by chief content officer Scott M. Gimple, showrunner Angela Kang, Robert Kirkman, Gale Anne Hurd, David Alpert, Greg Nicotero, Tom Luse and Denise Huth. The series will return on October 7 at 9:00 p.m. ET/PT at AMC.